The Pinnacles are four long-term cycles, or periods, on your Life Path. Each Pinnacle represents a particular lesson we are working on. 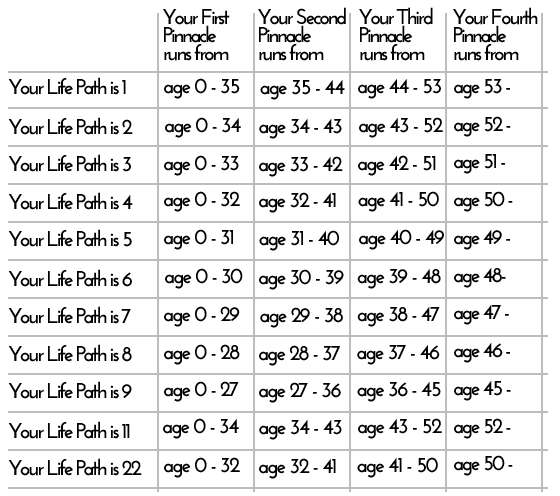 The first Pinnacle usually lasts from birth to between the ages of 30 and 35 (your specific Pinnacle periods are provided below - as with the Period Cycles, the duration depends on your Life Path number). The middle two Pinnacles each last nine years. The last Pinnacle will stay with you for the remainder of your life. The table above shows the duration of your Pinnacle Cycles. The start and end of these cycles is based on your Life Path. The science of numerology comes natural to us. It is impossible to talk about patterns in life without symbols, and numerology is a language of symbols—the symbolism of numbers. Symbols serve to draw upon themselves the vast amount of knowledge that exists in the archetypal world. Archetypes are unique bundles of information stored in the psyche until we have the means to attract their wealth into our lives. They convey knowledge of things that we previously did not know, or were not conscious of. The Pinnacles are very important aspects in your numerology reading. The transition from one Pinnacle to the next is always strongly felt. Your Pinnacles reveal the general conditions and events you will experience during the period. They describe the atmosphere, the environment, and the essential challenges you will be faced with. You can prepare yourself for the times ahead by knowing your approaching Pinnacle number. The transition from one Pinnacle to the next happens gradually over a period of about 2 years - the last year of the previous cycle, and the first year of the next cycle. You will likely make some life-altering decisions - marriage, job or career change, or any number of major changes in your character. Perhaps the most strongly felt change - internally as well as externally - is the transition from the first to the second Pinnacle. This change usually takes place in your late 20s or early 30s - the exact date depends on your Life Path number (see the graphic - also check your numerology chart). This is usually a difficult transition, but once crossed it provides a clear sense of direction in one's life. It also gives you a much firmer sense of your identity. It is a gateway to maturity.